This year sees Clerkenwell Design Week celebrate its 10th edition, taking up residency in one of London’s key hubs for design and architecture. From new designs by Ronan and Erwan Bouroullec for Established & Sons to Fritz Hansen’s exhibition in collaboration with Zaha Hadid Architects and an outdoor cooking space serving food by Kitchen Architecture, CDW’s 10th edition is a show full of celebration and achievement. Set across three days, 21 – 23 May 2019, CDW is the annual focus for London’s leading design district. The festival programme has been tailored to reflect the unique nature of this culturally rich area playing host to hundreds of showrooms, fringe events, talks, workshops and installations. 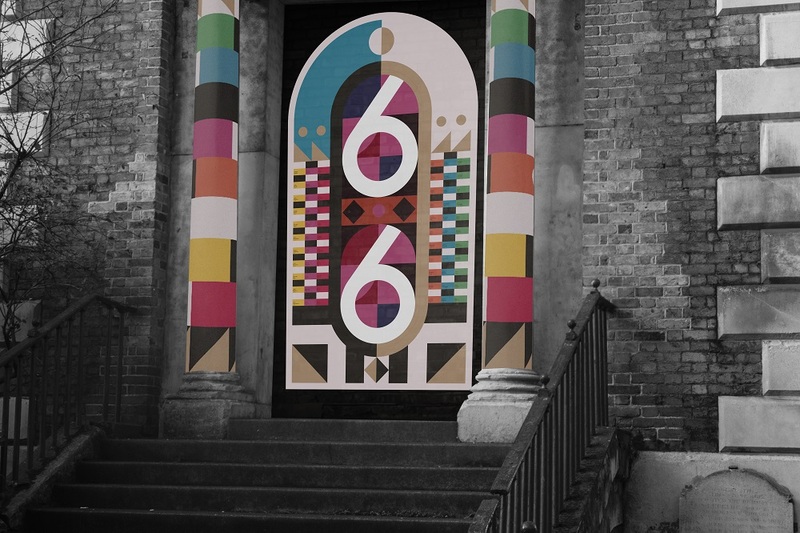 For CDW Presents 10 year anniversary, expect exciting street spectacles, including Once Upon A Time in collaboration with UAL, in partnership with Landsdown’s London which takes inspiration from the rich and sometimes dark historical tales of Clerkenwell. For this initiative, CDW have collaborated with BA Graphic Design Communication students at Chelsea College of Arts to create a series of graphic installations inspired by the stories relating to the significant locations. The seven winning entries have been chosen by a judging panel including; Max Fraser, CDW Content Editor; Priya Khanchandani, ICON Editor, and David Barnett, Chelsea College of Art Course Leader, BA Graphic Design Communication. In conjunction with the project, Lansdown’s London will be hosting historical walking tours during CDW exploring its past as a centre of making, from clock-makers to gin distillers. Winning designs by: Alistair Ramage – St James Church, Carrie Maxwell – Smithfield Market, Alba Skottowe – Farringdon Station, Rory Brown – Passing Alley, Maxim Cook – Passing Alley, Natasha Lopez – House of Detention and Woon Ko – Jerusalem Passage. CDW will also present Decade, a dramatic trail of 10, three metre high candle-like beacons designed by pioneers within the creative industry as well as confirmed collaborations with brands such as Hakwood and Parkside. The installations, symbolic of birthday candles will also form part of CDW’s wayfinding strategy to help guide visitors across the exhibition route whilst playfully celebrating CDW as the UK’s leading independent design festival. With a nod to the area as London’s creative heart, each installation will showcase the designers’ individuality and imagination. WR-AP architecture studio in collaboration with Haines Watts will be creating an installation made from everyday objects inspired by the historic Clerk’s Well north of St. John’s Gate. Small. with support from WSP Design Studio will bring BottleHouse™ in Brewhouse Yard to CDW by designing sustainable shelters for those in need made from discarded plastic bottles washed up from the shore, creating a new circular economy within the plastic economy. CDW’s installation Reflect Us, created by artist Beau Kerouac intends to bridge gaps in society by confronting visitors with illuminated eyes etched onto 10 glass gateways, telling the stories of the homeless from our city streets. Using AR technology, Beau Kerouac invites visitors to question how an act of respect; simply making eye contact, can change someone’s day for the better through shared experience. 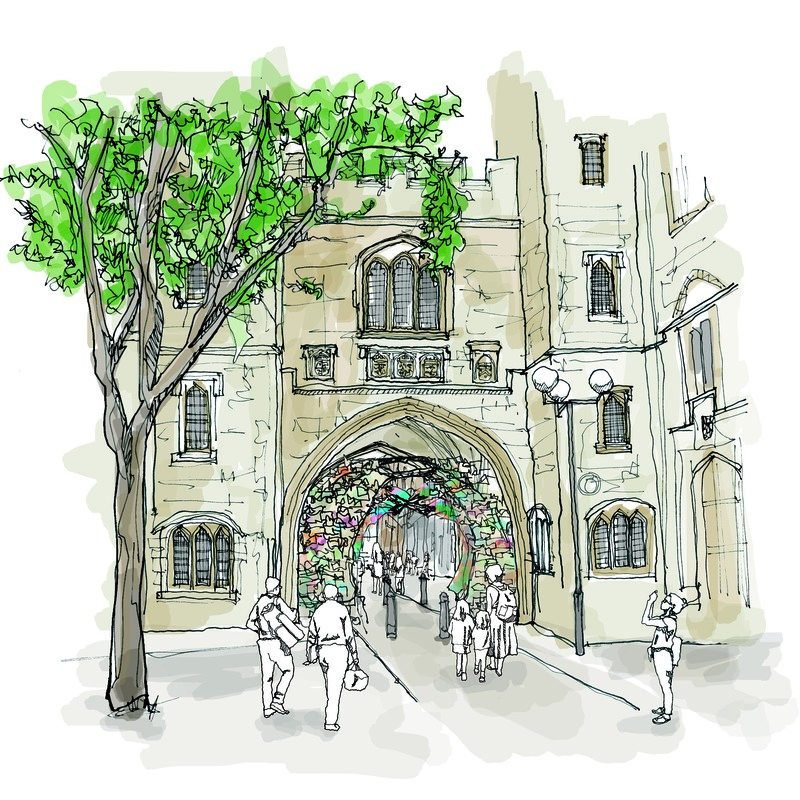 For its fourth year, Scale Rule is back, engaging students from around London to create a concept which inspires visitors to take a moment and look up, by creating an arch within an arch in the historical location of St John’s Arch. This year’s winning concept plays with the idea of space and enclosure by subtly drawing on the historic form of St John’s Gate. The design proposes a densely built timber structure that will be inserted within the void of the archway, with openings ‘carved’ away to allow a route through. The structure is filled with moments of colour that intensify towards the top of the arch, drawing visitors’ gaze upwards towards the historic architecture. This colour is created by using recycled materials and fabrics that reference the design culture that defines Clerkenwell today. For CDW’s 10th anniversary, the Talks will take place in the Moth Pavilion designed by architect Pereen d’Avoine from Russian for Fish. A vast canopy of recycled fabric will evoke the wings of a moth hovering over Spa Fields Park, as though a giant winged creature has temporarily alighted among the trees. Conversations at Clerkenwell, curated by Katie Richardson brings to life topics of the day with leading and emerging designers, architects, thought leaders and creative institutes. Highlights for 2019 include a workplace panel including Sebastian Wrong and Erwan Bouroullec, in conjunction with Established and Son’s installation for CDW, discussing how good design can shape the workplace of the future. Benjamin Hubert joins Max Fraser for a chat on his latest collaborations across the CDW event. New London Architecture showcase some outstanding work for an ongoing public housing project, including a submission by Alison Morris Architects and the talk will be chaired by Ben Derbyshire, the president of RIBA. OnOffice will host a panel session of design-innovators making a difference to wellness in the workplace. The full programme will be announced closer to the show. Talks are ticketed at £5. For Clerkenwell’s 10th anniversary, a plethora of exciting pop up showrooms and workspaces will take place during the festival. Established & Sons will take up residency in Fora to launch four new designs including The GRID SOFA by Ronan & Erwan Bouroullec, the KD TABLE and BEAM TABLE by Konstantin Grcic and the LUCIO CHAIR by Sebastian Wrong. Conceived as a complete take-over of Fora’s breakout spaces, the installation will invite visitors to explore the possibilities of Established & Sons’ new, innovative designs by trying them out with hot-desking, wi-fi and refreshments from Fora’s in-house cafe. The installation will be complemented by a series of talks, workshops and events. Fritz Hansen will be collaborating with Zaha Hadid Architects to showcase aspects of their Heritage Exhibition, whilst Relay Design Agency will present + Halle, Baux, Orsjo, Mitab and Zeitram within a fashion house on Clerkenwell Road. KI, one of the world’s largest manufacturers of workplace and education furniture will take over an architectural gem in the centre of the festival site. The pop-up showroom at the landmark Paxton Locher House on Clerkenwell Green will be transformed into ‘KI House’ for the launch of several new UK-designed & manufactured products. Integral to the festival are the local resident design showrooms, many of whom partner with CDW, providing an array of stimulating events from talks and workshops to major installations. Coinciding with CDW’s 10th anniversary, an abundance of new showrooms will arrive in Clerkenwell including Optelma, Vescom, Fredericia, Workstories, Duravit, Abstracta, Piemme Industrie Ceramiche S.P.A, Haiken Ltd, , Savile Row Projects, Parkside and JPMA Global. New Clerkenwell resident, Fredericia will officially launch new pieces by Jens Risom, Danish American designer, in the UK for the first time during CDW. Following from participating in Light last year, award-winning British luxury lighting brand Bert Frank will open its first showroom in EC1. Parkside, the design-led tile specification company will be launching Sequel by Alusid, a sustainable range featuring 98% recycled content. The topic of sustainable design will form the focus of a series of activities at their new showroom site in Clerkenwell. Danish carpet brand Ege will showcase new additions to their Industrial Landscape collection, created in collaboration with world renowned interior designer, Tom Dixon who will also be speaking about his design philosophy in the space. CDW’s exhibitions are hosted in distinctive spaces around the area linked by a route running through the centre of EC1. There are seven exhibitions, each with a different curatorial focus, ranging from cutting edge international design, to emerging talent, lighting, luxury interiors and the best of British design. British Collection Now in its fourth year, British Collection will be located in the Crypt of St James’s Church. Designers from all over the UK will showcase their latest furniture, lighting and product designs within this historically rich space, showcasing craft techniques, quality materials and design excellence. West & Reid, Brixton-based cabinet makers will be making their debut at the British Collection, showcasing some of their most popular materials and design styles all made with sustainability in mind. Benchmark, the powerhouse of British craft will be presenting new collections, whilst iconic British design brand ercol will be showcasing new collections for the first time at CDW. Wiltshire based company Forest to Maker will be presenting a selection of hand crafted wooden furniture which embraces natures imperfections. Other renowned names in the British furniture industry exhibiting include Hand & Eye Studio, Pluck and Nathan Furniture. Situated at the northern end of Clerkenwell, Design Fields will host a busy hub, showcasing leading furniture, textiles and product design from all around the world, from kitchens to bathrooms to the workplace. Thonet will celebrate 100 years of Bauhaus at CDW with new interpretations of the side table series MR 515 by Ludwig Mies van der Rohe and a new colour concept for the iconic Coffee House Chair 214, both by Studio Besau Marguerre. Danish company, True North Designs will be presenting their new Regatta chair for the first time to a Britis audience. The Regatta chair designed by Asger Soelberg has a solid oak frame in the mid-century style with a walnut veneer and can be stacked. Other exhibiting companies include Wagner, from Germany; La Cividina, and Tacchini from Italy and Bute Fabrics from Scotland, all displaying innovation and clever use of technology in their designs. Light Back by popular demand, Light will showcase the top international lighting brands located within the brick vaults of fabric, the former cold-store turned nightclub. Exhibitors include Belgian based company Wever Ducre who create trendsetting lighting sytems. Established in 2015, Swedish design brand Pholc will be showcasing lighting in collaboration with talented designers, each sharing the Scandinavian aesthetic. Austrian based company XAL will present their revolutionary MOVE IT SYSTEM, whilst Danish design brand Ebb & Flow will showcase colourful lamps in natural materials and the spectacular crystal pendant, Smykke. Other exhibitors include Graypants, John Hollington Design, Lomas Furniture, Syska and ARKKI by Lovi. Elements brings together a leading selection of ironmongery, hardware, switch plates and architectural accessories within a street-market style pavilion on St John’s Square, becoming a goto destination for designers looking for the perfect final finish. This year, English ironmongers Beardmore will showcase contemporary products, whilst their master pattern maker will demonstrate the lost-wax casting process for visitors to witness this disappearing craft. Aston Matthews will be exhibiting for the first time, showcasing a diverse range of taps and shower fittings including the Acme collection in scuffed brass and Alto in bronze Other exhibitors confirmed for Elements include Harbine, TIRAR, Dowsing & Reynolds, Hamilton and Carrson International among others. Detail at The Order of St. John reflects principles of fine craftsmanship and high glamour, showcasing the most prestigious names in luxury interiors. Selected brands feature throughout the venue’s majestic Church, Crypt and Cloister garden.This year at Detail, Arte has collaborated with Moooi to create a luxurious wallcovering collection, Extinct Animals. Each pattern is inspired by characteristics of one extinct animal from Moooi’s Museum of Extinct Animals. They have also created the Vanguard collection, inspired by abstract art from the 1950s and 1960s. Scandinavian company Svensson will be showcasing their new spring collection, including Calla, an acoustic curtain that reduces noise within its soft drapery. Anna Hayman Designs will present maximalist, luxury homeware inspired by the Bloomsbury movement and the Biba era. Other exhibitors include Danish furniture brand Cane-Line, Sinclair Till, Samuel Heath, Artwood and Altfield. Hosted within the subterranean depths of The House of Detention, Platform showcases exciting upand-coming design talent in the historic surroundings of this former remand prison. This is a rare opportunity for the public to explore part of London’s infamous history. Exhibitors here include Monkey Puzzle Tree, who collaborate with fine artists to produce unique designs. The business has a strong social conscience, paying the artists a generous royalty and supporting British manufacturing. Gwendoline Port Designs will present a modular concept RAILS, inspired by the form of railway tracks and the concept of ‘journey’. These limited edition functional sculptures are playful, graphic and ergonomic. They can be stacked on top of one another to form a column, multiplied to form a hexagonal, or separated to become a stool, chair, coffee table or side table. Junction Fifteen will make their first appearance to showcase their new Morf Collection whilst British designer Pete Hill Design will showcase an array of products crafted from wood. Junction Fifteen Other exhibitors include Arte&Stili, Olenka, Takumi, Trouping Colour, Decimal Design Paris and Glas Design. Launched in 2016, Project’s first outing was so successful it was extended to cover two linked pavilions for Clerkenwell Design Week 2017 and will be even bigger for 2019. Set in the Garden of St James within the beautiful grounds of Clerkenwell’s parish church, Project brings together a leading selection of flooring companies from modulyss to Gerflor. AllSfär, a brand dedicated to improving workplace wellbeing will also present a collection of workplace furniture, whilst Sixteen3 will present stylish, high quality, upholstered seating for the commercial market. Other exhibitors include Guialmi, Aeris, Amtico, Modulea, Panaz, The Meeting Pod co and Rigg. As well as hosting an abundance of furniture and interiors showrooms, Clerkenwell is also home to a variety of other creative practices including architects, branding agencies and craft studios. In celebration of CDW’s 10th anniversary, a selection of 25 of these local practices, including London Metropolitan Archives and Patrick Lewis Architects will throw open their doors to the festival’s visitors and host workshops, displays and installations. This entry was posted in Events & Exhibitions by Rob. Bookmark the permalink. Copyright ©' 2019 Refurb Renovation News Ltd . All Rights Reserved.